NASA's order to employees to suspend most contact with Russian government representatives is the latest U.S-Russia political development in the ongoing crisis over Ukraine, but the new policy may not have many on-the-ground effects for people working at the American space agency, according to one space historian. 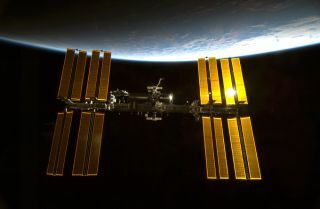 A NASA statement released Wednesday (April 2) directed U.S. space agency officials to suspend contact with Russian government representatives, but ongoing operations on the International Space Station are exempt from the new policy. The statement was released hours after a leaked NASA memo stating the same policy. Other U.S. government agencies are also curtailing contact with Russian government officials, NASA spokesman Kelly Humphries told Space.com. "The NASA statement clearly states that 'NASA is suspending the majority of its ongoing engagements with the Russian Federation' except ISS [International Space Station]," said Siddiqi, a Russian space program analyst at Fordham University. "So, from my perspective, the fact that cooperation on ISS hasn't been affected suggests that things will proceed largely as before." Roscosmos, the Russian space agency, and NASA do engage in some other scientific collaboration, but most partnerships between the two organizations take place within the space station program. "To my knowledge, NASA and Roscosmos don't have that many cooperative programs besides ISS," Siddiqi said. "I believe they have some instrumentation on a couple of NASA planetary vehicles and things like that. But ISS is really it. So as long as ISS isn't affected, I wonder if this is largely symbolic." Even if symbolic, the contact ban could still affect morale on the ground and even in space, Siddiqi said. The policy shift may affect Russian and American crewmembers on the space station, he added. He also called the contact ban unique in the post-Cold War era. "At the height of the Cold War … there was hardly any significant cooperation in space between the two superpowers," Siddiqi said. "So I would say it's still not as bad as that time." But in the post-Cold War climate, "I would say that this is pretty serious. I can't remember a time in the past 20 years when either side made such a bold statement about not cooperating with the other side. It may only have symbolic effects (given its exemption of ISS), but the statement itself is unprecedented." At the moment, NASA relies on Russian-built Soyuz capsules and rockets to transport astronauts to and from the International Space Station. The agency hopes to change that practice by 2017 by switching to privately built U.S. vehicles when ferrying astronauts to and from the orbiting outpost. NASA chief Charles Bolden has said that, if given proper funding, the commercial crew program could get off the ground as much as a year earlier, in 2016. "The companies are moving very rapidly — as rapidly as they can, based on the funding that we've given them to be able to be ready to fly as soon as they can," Bolden said, while addressing members of Congress on March 27. "I would be hesitant to say that we could accelerate it any more than a year, but we could potentially accelerate it by a year if we're given adequate funding." During that same hearing, Bolden also said that Roscosmos could not operate the space station without United States support. "Because we provide navigation, communications, power … I hate to deal in conjecture," Bolden said. "The partners would probably have to shut the space station down. If you're thinking that the Russians will continue to operate the International Space Station [on their own], it can't be done." For his part, Siddiqi does not think that NASA's move will cause Russian officials to limit NASA's transportation to the space station. "No, barring any further deterioration in the Ukrainian crisis, I don't think the Russians would take that step, to limit U.S. access to ISS," Siddiqi said. "I just don't think it's in their interest. They have more to lose [than the U.S.]."